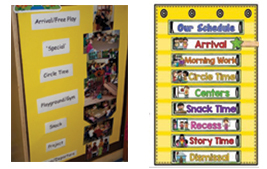 Routines help your program run more smoothly and let children know what to expect when. Fillable form to help you create a customize schedule for your program. Daily routines are a big part of a child’s day. Hellos and goodbyes, diapering and toileting (every 2 hours and on demand), mealtimes (every 3 hours and on demand), napping, and getting dressed provide opportunities to promote learning and development. 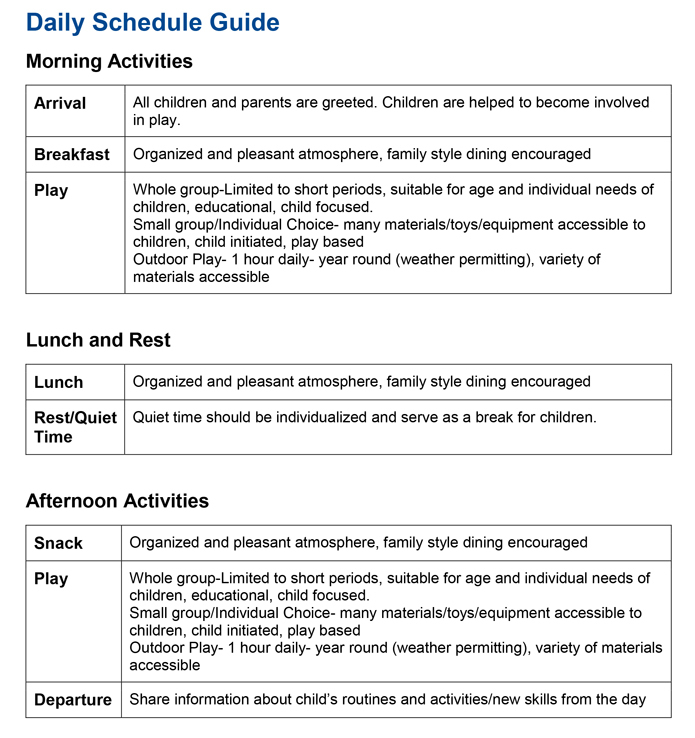 Greeting and departing provides the opportunity for parents and staff to share required information about the child. Pleasant and organized drop off and pick up times help with the transition of home and child care. Each child and parent should be greeted warmly and children are given the time and sensitivity to adjust to the transition of arrival or departure. Routine tasks such as diapering and toileting should be carried out in a relaxed and individual manner. These offer opportunities for pleasant interactions between the provider and children, and promote pleasant conversation and self-help skills. Mealtimes and related activities--such as setting the table, handwashing, interacting with other, and brushing teeth-- give children opportunities to develop self-help, communication, and social skills. Naptime is an important routine in child care. Setting up a comfortable, personalized, and predictable space for napping helps children relax and get the rest they need. Supervision should be pleasant, responsive and warm for all children. Transitions are the time in the day when children move or change what they are doing. These typically include arriving for the day; moving from one activity to another; cleaning up after playtime; preparing for outdoor play, snack or nap time; and preparing to go home. Effective transitions happen when children flow smoothly from one activity to the next without long waits or troublesome behavior. This works best when a few children are transitioned at a time, instead of the whole group. A visual (photographs, pictures, charts, etc.) can help to communicate expectations to young children and avoid challenging behaviors. Unlike verbal instructions, a visual provides the child with a symbol that helps then to see and understand words, ideas, and expectations. Perhaps best of all, a visual schedule keeps the focus on the task at hand and negotiation about tasks is not provided as an option.